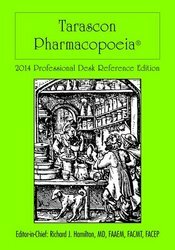 The Tarascon Pharmacopoeia 2014 Professional Desk Reference Edition recently received 4 stars from Doody’s Review Service. According to reviewer, Lawrence P. Carey, BS, PharmD, from the Temple University School of Pharmacy, this reference “is more comprehensive than others of its kind, such as the various prescriber drug guides." “This reference is intended for a variety of audiences, ranging from practicing prescribers to students. Any healthcare professionals who prescribe and/or provide drug therapy to patients should find this helpful. Each entry provides dosing information for both adults and children, lists pertinent information such as mechanism of action and adverse effects, and contains miscellaneous pearls such as monitoring parameters. There are also a significant number of tables and charts for important data such as a cytochrome P450 list of drugs that use that system, broken down by whether they are strongly or weakly affected. Want to learn more, or purchase a copy? Visit the Tarascon website.